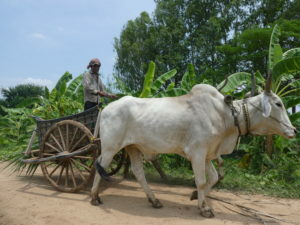 In Cambodia, research focuses in two provinces of the Upper Mekong Delta: Kandal and Takeo. The province of Kandal (in yellow on the map) is characterized, among others, by a multitude of earthen canals called “Preks” that date back to the late 19th century. These Preks have been described and are used in multiple ways over the last 150 years: sedimentation (colmatage) canal, navigation channels, fishing ground, irrigation or flood management canals, etc. We conducted a study that aimed at better understanding the hydrological functioning of these systems in relation to on-going rehabilitation projects (Pratx, 2017). In the southern part of the Takeo province (in green), which has witnessed large scale infrastructure development over the last 20 years flooded for over 4 months every year, the research focuses on understanding local institutional arrangements, between farmers, water user association and small scale private entrepreneurs, which support irrigation practices. 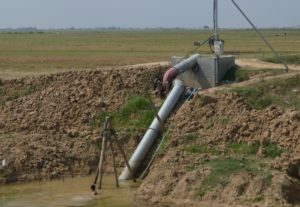 These local level studies on specific irrigation infrastructures and local modalities of water management in the Upper Mekong Delta serve as entry points to interrogate how the government (more specifically the administration of the Ministry of Water Resources and Meteorology- MoWRAM) and different development agencies (e.g. the French Agency of Development and the Australian Department of Foreign Affairs and Trade through the CAVA project) envision the Cambodian floodplains, which are seldom discussed in deltaic terms. This, in turn, lays the ground for a comparative study with team members from the Netherlands. 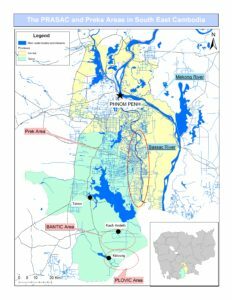 The study crosses the national boundary between Vietnam and Cambodia: we study and contrast the Vam Nao project in Vietnam and the largely un-infrastructure Kandal province in Cambodia, and discuss acid sulphate soils, polders and floating rice as different socio-material configurations that reflect overlapping visions of a deltaic environment.